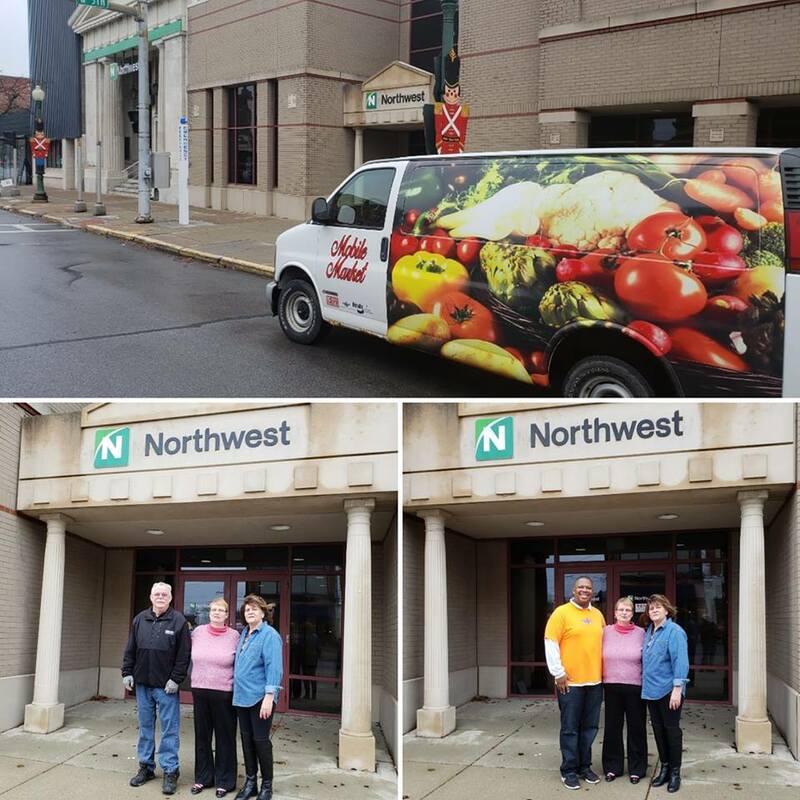 12/21/2018: Thank you to Northwest Bank for their donation of storage cabinets for our pantry that supports the Mobile Market. Invest Elyria is once again busy preparing for the rest of the calendar year. In the planning stages we are working with several people and organizations to make the end of this year memorable for those in need. Beth Doyle and her group "The Elyria Hookers" a knitting and sewing group for the Warming Drive during Compassion Week where last year IE and the Elyria Hookers were able to knit or collect over 1500 items that were put out in Elyria Square for anyone needing the hats, gloves, scarves, and other new and gently used clothing that Elyrians donated. Barbie Blackhall and her project- Warm Angel Blankets Drive that last year collected clothing and blankets for the homeless. Anyone that would like to donate McDonald's $5 Gift Cards for the homeless, please purchase and drop off at St. Andrews Church (Holly Lane entrance - there is a mail slot there). 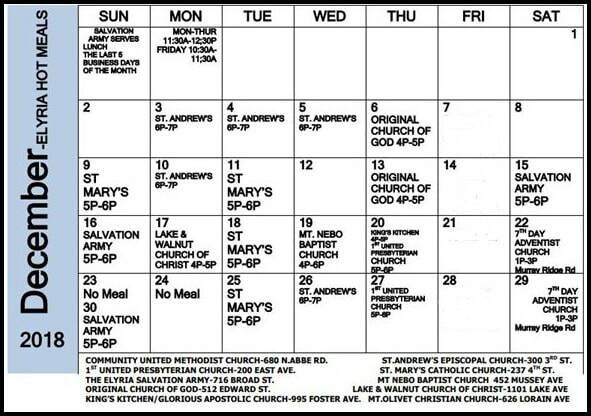 McDonald's Gift Cards can also be sent by mail to: St. Andrew's Episcopal Church, 300 3rd. St., Elyria, OH 44035. Any questions: please contact Mary Bryan by private message on Facebook. Drive ends April 1st, 2019...Thank You! Yarn/Warm Clothing Donation Drive for the Warming Event–Did you know there is an Elyria group dedicated to the yarn arts? Knitter's, crocheters...all are welcome. 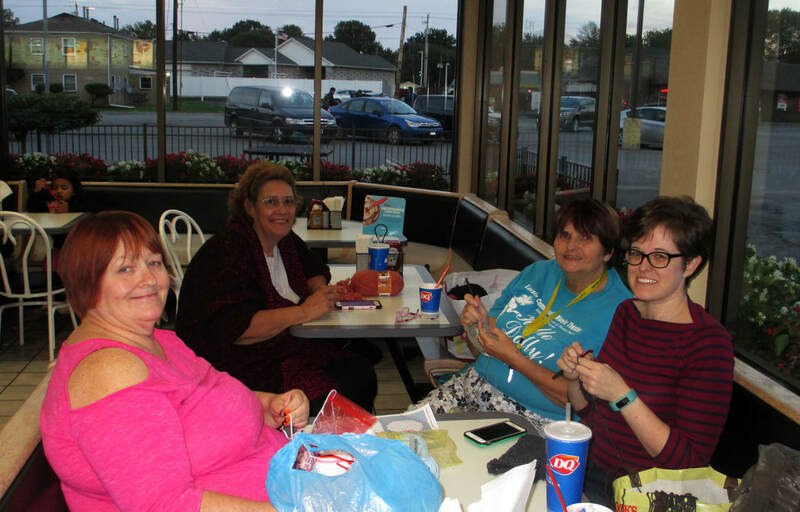 The Elyria Hookers have meetings on Thursday evenings, 6 p.m. at Dairy Queen on Hilliard Dr., Elyria, OH. We are also doing the Warming Event where we hang donated and our handmade warm clothing, scarves, hats, and gloves in Ely Square on Jan.21, 2019. 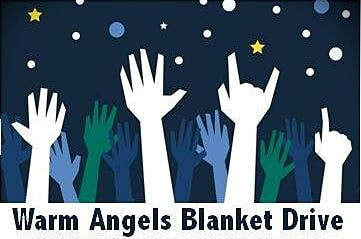 If you would like to donate yarn or donate items like hats, gloves, scarves, new or gently used sweaters, hoodies, and jackets(make sure zippers work) there is drop off location at : Dairy Queen on Hilliard Dr., and at Roxy's Emporium 604 Middle Ave. 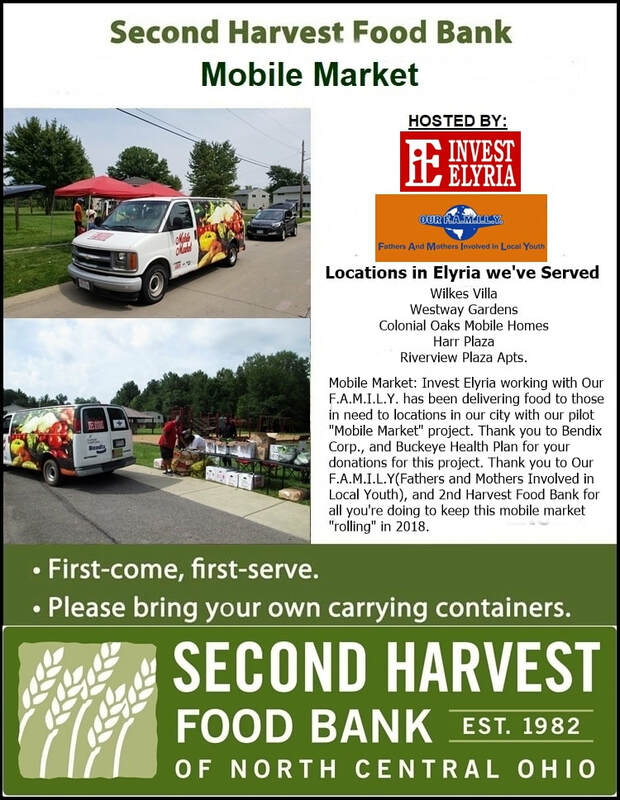 Questions please contact Beth Doyle by private message on Facebook, email: easpatholt@yahoo.com, text at 330-429-5013, or email Mary Bryan at m.bryan@investelyria.org, pick-up is available. Deadline for donations is Jan. 14, 2019 ...Thank You! 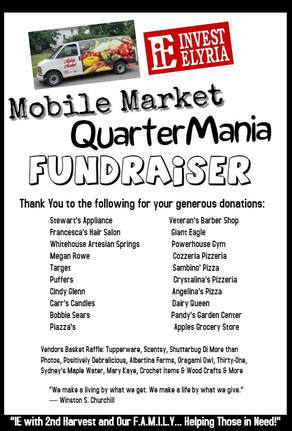 ​Thank you to all came out for our Mobile Market "QuarterMania" fundraiser. Thanks especially to Bobbie Sears, Donna Bond, Jacque Mancuso for putting this together and all the volunteers, vendors,The Salvation Army and staff for their help, and local businesses that donated to make this fundraiser a success. 12/22/18: ​IE donates $100 to 2nd Harvest Food Bank of North Central Ohio's Holiday Cheer Campaign-a community-wide fundraising effort to help local families struggling with Holiday Cheerith hunger. Every donation helps make the holidays brighter for our neighbors; for every $1 donated we can provide five meals.